The Port Arthur Historic Site Management Authority (PAHSMA) is proud that the Port Arthur, Coal Mines and Cascades Female Factory Historic Sites are among eleven historic places that together form the Australian Convict Sites World Heritage Property. The Australian Convict Sites were inscribed on the World Heritage List in 2010. Consisting of eleven sites spread throughout Australia in Tasmania, New South Wales, Western Australia and on Norfolk Island, the Australian Convict Sites tell the epic story of Australia’s convict heritage. Each site in the Property represents a different aspect of the convict system and are the most significant examples in Australia’s history of forced migration. Almost half of the Sites in the inscription are in Tasmania. The Port Arthur Historic Sites are at the forefront of Australian heritage management practice. A program of professional conservation management was established at the Port Arthur Historic Site in 1980; this was the first in Tasmania and one of the first in the country. This program established cooperative relationships between archaeology, interpretation, architecture and engineering at Port Arthur. We continue this today with our team of conservation professionals and trades staff who are responsible for planning and carrying out the ongoing heritage and infrastructure works that are essential if the Port Arthur, Cascades Female Factory, and Coal Mines Historic Sites are to be conserved and protected for future generations. Conservation of the sites is guided by State, National & International, guidelines, policies and procedures. Please note that dogs are allowed at the Coal Mines Historic Site but need to be on a lead at all times as the site is home to large numbers of native wildlife. This wildlife is often vulnerable to the scent left behind by dogs and can be disturbed by behaviours such as barking, digging and chasing. Some of the wildlife are also vulnerable to diseases that may be carried by dogs. Please keep your dog on a lead and stick to the paths as much as possible. 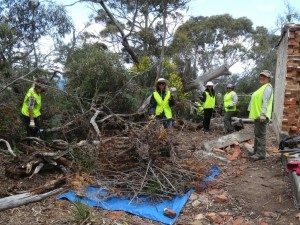 On the last Monday of every month, members from the local community and Port Arthur Historic Site Management Authority spend a few hours walking around the Coal Mines Historic Site observing and collecting data on the bird species present. What started out as a short term recording project to support growing the body of knowledge around the natural values at the Coal Mines, has now turned into a long term data set that is into its fifth year of collection. Members of the public are welcome to attend these surveys, which begin at 9:15am, and conclude around midday. To find out more email caitlin.vertigan@portarthur.org.au, or phone 6251 2335.